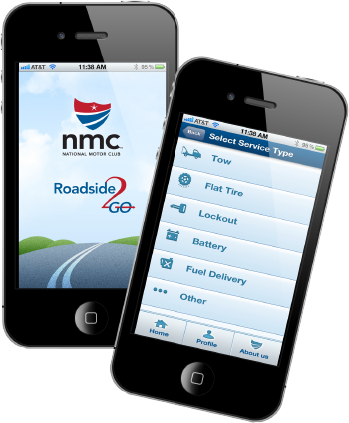 NMC's free mobile app for iPhone and Android allows you to quickly and easily request roadside assistance in just a few simple steps. Roadside2Go is a National Motor Club (NMC) app that enables our members to quickly and easily request roadside assistance in just a few simple steps. Enter and save your Member information one time only, select the type of service you are requesting and then push the 'Call for Service' button. It's that simple! Leverage NMC's nationwide 24/7 roadside service provider network and your phone's GPS capabilities to route assistance directly to your location. 1- Do I have to have a membership? 2- What mobile devices are supported? *Members are responsible for payment to the independent service provider for any charges exceeding the plan benefit limit per disablement. All benefits are subject to the terms and conditions set forth in the current Member Benefit Guide. Services provided to individuals who are not National Motor Club members are subject to fees. © Copyright 2013 National Motor Club of America Inc. All rights reserved.